Today’s selection comes courtesy Divaliscious in Dutchess County, New York. The recipe was located and attempted courtesy of GroupRecipes.com. Dutchess County just sounds like the kind of a county that would make really good fruit pies. 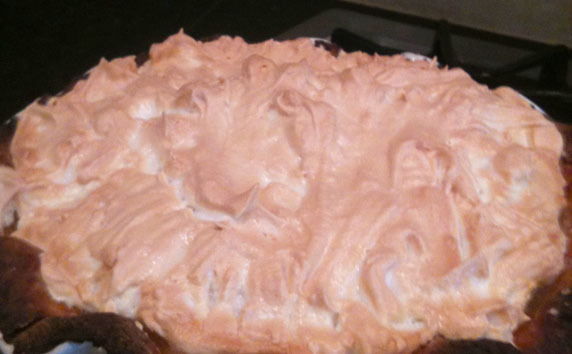 This pie doesn’t have orange slices but is an orange flavored custard with a meringue topping. Preheat oven to 425 degrees and have shelf placed on the lower level in the oven. Separate two of the eggs – beat egg yolks and 1 whole egg well in mixer. Add sugar and blend well. Add evaporated milk, orange juice, orange zest and pure orange extract. Continue to mix until blended. Pour into pastry shell and bake in preheated oven for 30-40 minutes until custard is firm and knife comes out clean. Cool pie slightly. While pie is cooling, beat 2 egg whites and 4 tablespoons sugar to make meringue. Remember people, make sure the meringue is blended until it forms stiff peaks. 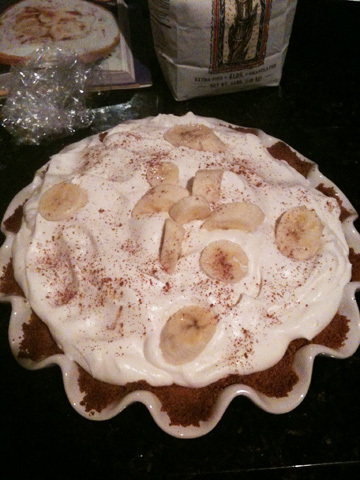 Top pie with meringue and bake in moderate oven (325 degrees) for 15 minutes or until lightly browned. The pie came out looking like it hadn’t fully baked. I realized afterward that I put in 1/3 cup too much orange juice. So this pie is going to be outrageously juicy. I also burned the crust which is never good. I need to put tin foil collars on these when they bake at 40 minutes. The pie tastes good but it’s not, as the name suggests, outrageous. It’s got a nice balance to it, but it’s also soggy. Not my worst but not one of the better pies either. It’s mid-range.